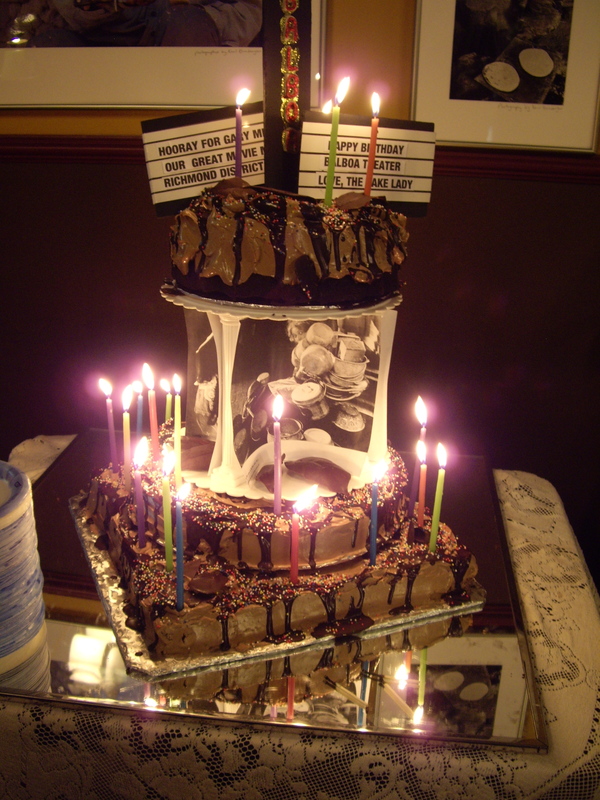 “We’ll be expecting up to 300 people,” said Gary Meyer, in reply to my offer to bake a cake for the Balboa Theater’s inaugural Birthday Bash to celebrate its 1926 origins; a party that swiftly became an annual event. My first cakes for the Balboa were all about delicious celebration, the theater, and Gary. From my massive food files I pulled out my “All Time Favorites,” recipes that have become sturdy, dependable friends. 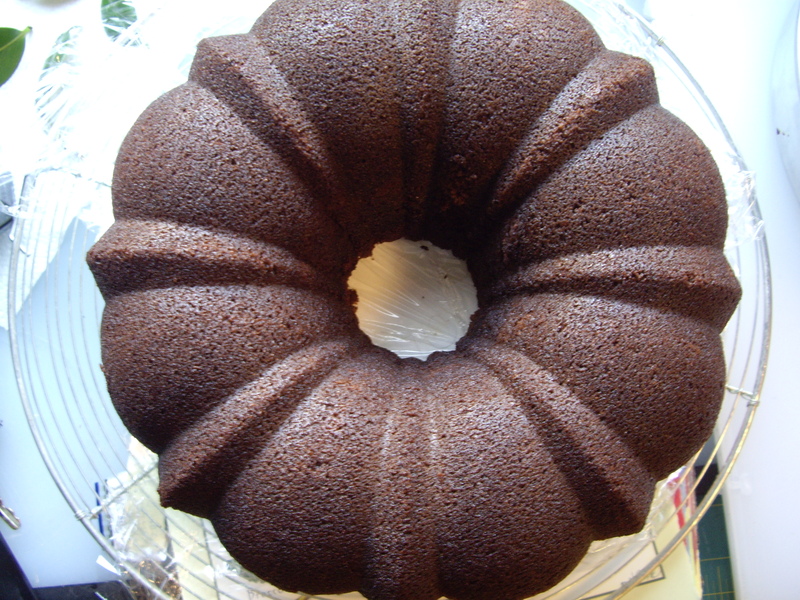 Throughout my many years of baking, it’s interesting how the oddest truth comes forward: you are never asked to do what you did before, so each cake requires a new approach. With each cake one must reach in, grab tight, and hold on to the left and right sides of the brain, mixing mathematics, experience, intuition, imagination, and nerve. “BALBOA” was created out of bread dough, cutting out the letters with tiny alphabet cutters, baking, painting them red with nail polish, affixing them on a black foam core, then adding the marquee with paper and printed words in the theater font. How do you make a cake for 300? The quick answer—as with the Elephant Stew recipe: “How do you make an Elephant Stew?” “First, catch the elephant”—is always, “Get the first cake batter in the oven.” Before I learned the formula for how many servings one cup of flour in a recipe will provide, I discovered that one cake baked in an angel food or bundt-style cake pan, frosted and finished, will cut into 25 pieces. My recipes, always doubled, baked in two of these pans, assure the first 50 pieces. For 300 people, six double batches. 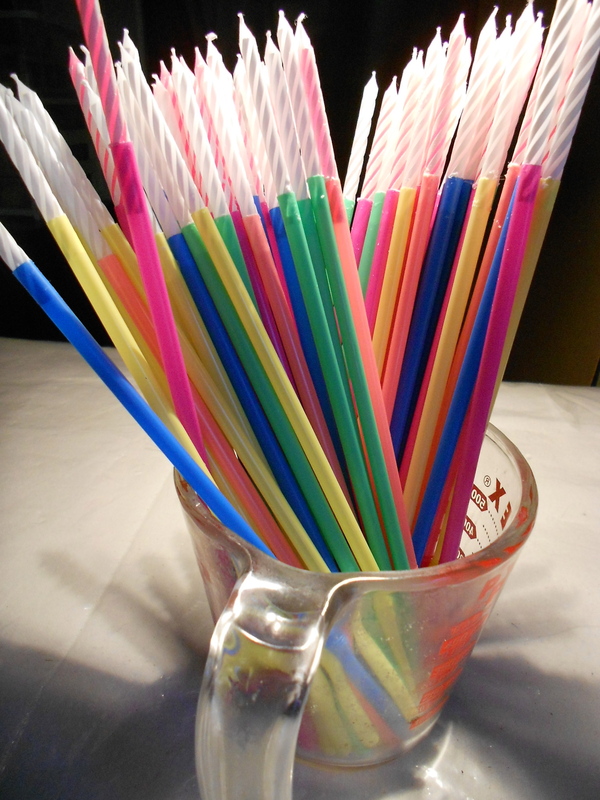 For big number birthdays—as when the Balboa turned 85—I made special candles by gluing regular birthday candles onto the tops of colorful straws. Three people, working fast, got the job done. January, 2006: I walked into the San Francisco Winter Fancy Food Show, program in hand. It didn’t take more than 10 minutes for me to find the booth for Walkers Shortbread featured on the program cover. 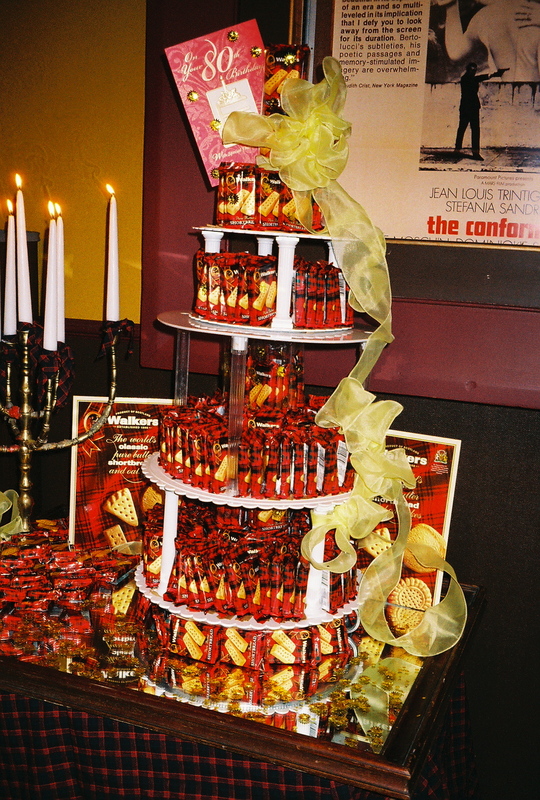 I began negotiations for cases of the shortbread to be shipped to me so I could fashion a birthday cake for the ever-worthy Balboa Theater, a valuable entity in a dwindling supply of neighborhood theaters. I created a 5-tier birthday cake from the shortbread packages, using double- stick tape to keep them in place. 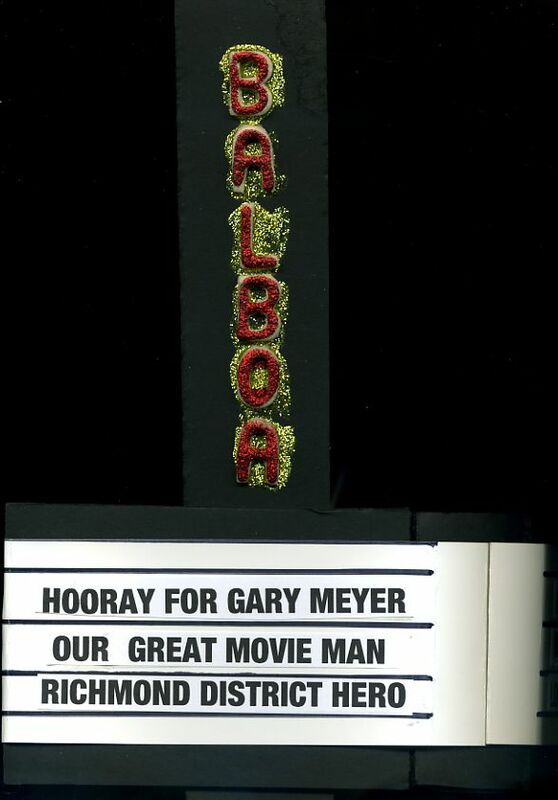 In 2010, there was a one-of-a -kind Food and Film event at the Balboa and Gary Meyer invited me to participate. He had programmed The Kings Of Pastry (2009), a documentary about a French culinary competition. 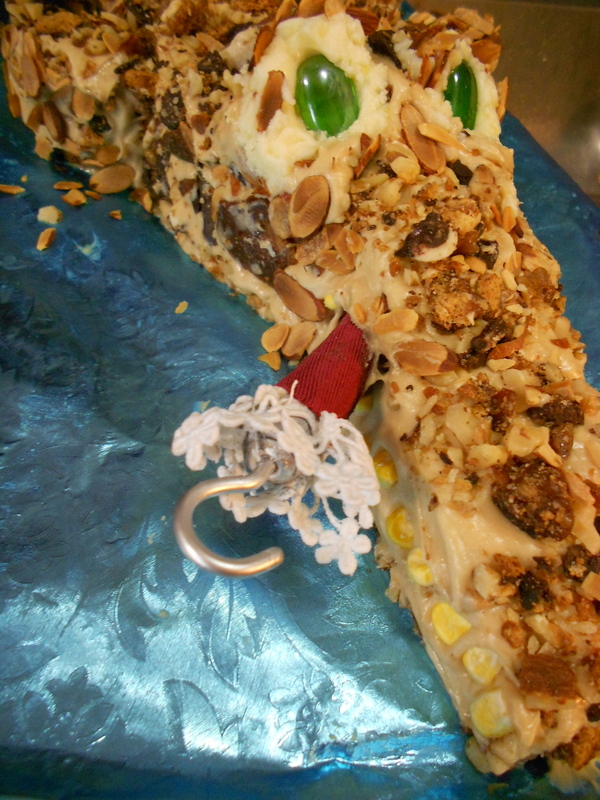 Yes, I baked a cake, but my best idea was to invite members of local group Bakers’ Dozen to join in. 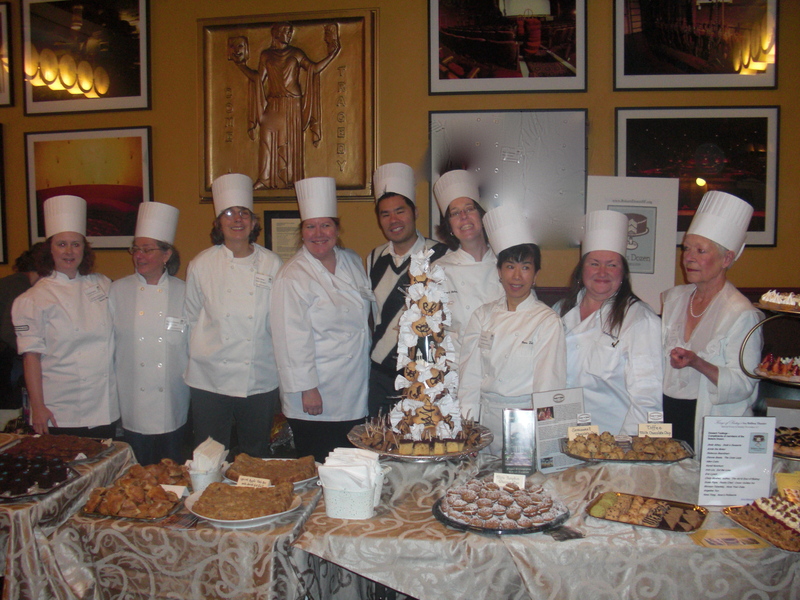 I envisioned an emotional audience streaming out into the lobby after watching the film, greeted by 13 chefs all dressed in white, offering a glorious display of delicious cakes and pastries. That’s exactly what happened. Standing room only! The last few years of birthday cakes centered on the themes of the 1920s films being shown, with stars like Rudolph Valentino, Mary Pickford, and Harold Lloyd in certain desperate situations, or movies like Peter Pan with edge-of-the-seat tension that I parlayed into cake design, such as Captain Hook’s arm, caught in the clutches of his arch enemy. 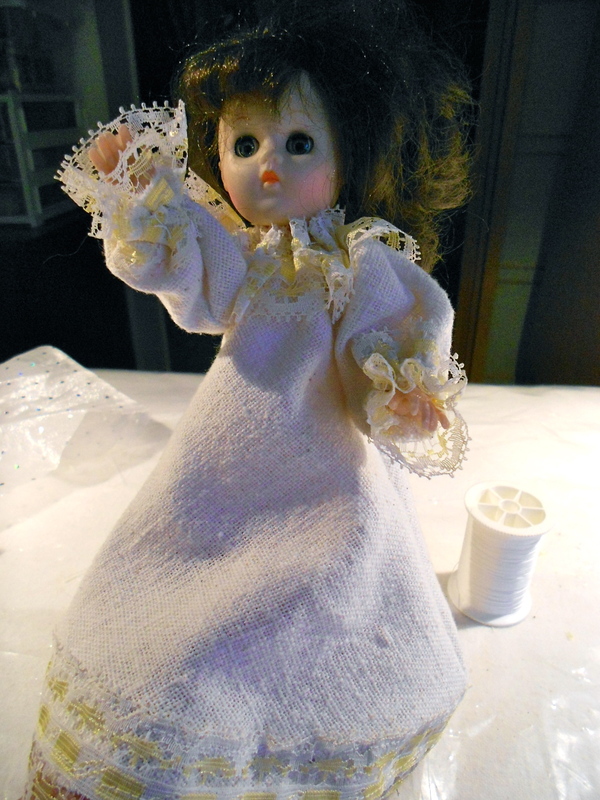 Clothespins, cup hooks, lace and fabric that served to create Wendy’s nightgown. 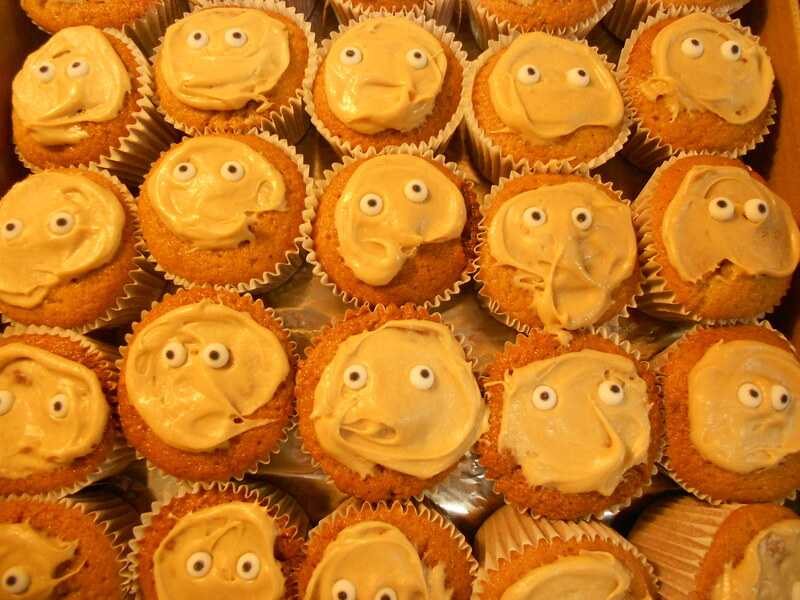 The “Lost Boys” from PETER PAN, in cupcake form. Baking the Balboa Birthday Bash cakes inspired me to try new techniques, and experiment with new flavors and designs. It was a week’s work that always ended with a great sense of accomplishment, especially when I saw guests going back for their third piece of cake. 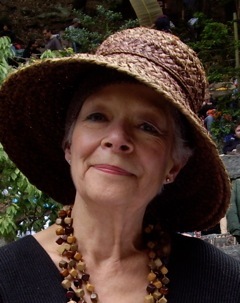 Dianne Boate, a former staff member of the original Dating Game television show, and later, The Renaissance Pleasure Faire, is The Hat Lady, maker of custom millinery, and The Cake Lady, a special events baker for 30 years in the Bay Area. Between cake assignments she has had several one-woman photography shows, and participated as a botanical illustrator in group shows benefiting the Conservatory of Flowers, National AIDS Memorial Grove, Marin Cancer Institute, and University of California Alumni Association. Her website can be found at http://www.boatecollection.com. This entry was posted in Columnists, Eat, Eat: Recipes and tagged A Baker's Dozen, Balboa Theater, cake decorating, Eat, Peter Pan. Bookmark the permalink. Great article and certainly fits the theme of this blog. Thank you Dianne! More? Yes, please. I’m always simply amazed at the many artistic productions of this very wonderfully talented ” lady”. Love that Dianne! She’s kind,creative and magical and I only wish I had been at all The Balboa parties and look forward to more of her articles. Congratulations and all good wishes to both Dianne and Eatdrinkfilms!